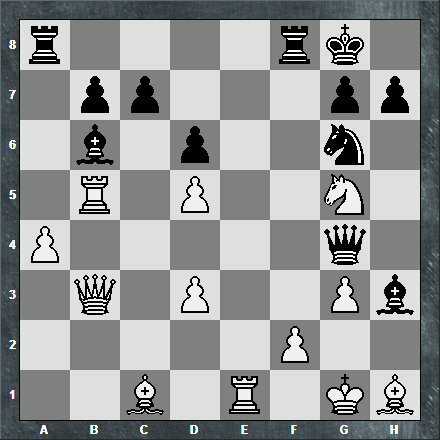 This week's game comes from the Colorado Springs Chess Club's July One Night Quick event (3SS, G/20; d/5). The idea behind the tournament was to honor a motion made by members at our annual meeting and attract a different type of chess player. Since we play slow chess (G/90+30) nine months of the year, it was a chance for quick players to come out and get three rated games. Also, the night ended earlier than normal. So, the early risers could come out, play some chess, and get home before ten o'clock. So far, the attendance has not matched our slow nights, and there has been some murmurings about getting rid of the quick event. I can't complain. I got to play two of the highest rated players in the event. I took first place. And I didn't have to direct the tournament. In addition, I got a little revenge on Mark McGough. Ever since I called him my whipping boy (https://cschess.webs.com/apps/blog/show/43998232-whipping-boy) in 2016, he has stepped up his game against me and has taken back a big chunck of the rating points I had gotten from him. In fact, this year we are even (+3-3=1) in the seven USCF-rated games we have played. However, this game put me back on the winning track and moved my total USCF-rated beats on Mark to 61. Now, I am only 6 more beats away from tying FM Isay Golyak's 67 beats on Mark. Of course, it isn't helping that Mark and I play a ton of blitz games together. He is one of my weasel-students. We play so often that he sees all my secrets and never pays me a dime. I even buy him pizza at Target's food court before our blitz matches. However, I think the pizza paid some dividends in this event. I started using LM Brian Wall's Fishing Pole tricks against Mark and found a bit of an achilles' heel. Mark can lose sight of the f2 pin in time pressure and give up some miracle mates. In this position, I was so used to the Fishing Pole style mate that I didn't realize there are two ways to get to mate with two moves. On July 31st, the Colorado Springs Chess Club held the July One Night Quick (3SS, G/20;d/5).